Belbin’s 1981 book Management Teamspresented conclusions from his work studying how members of teams interacted during business games run at Henley Management College. Amongst his key conclusions was the proposition that an effective team has members that cover eight (later nine) key roles in managing the team and how it carries out its work. This may be separate from the role each team member has in carrying out the work of the team. Plant: A creative, imaginative, unorthodox team-member who solves difficult problems. Although they sometimes situate themselves far from the other team members, they always come back to present their brilliant idea. Resource Investigator: The “Resource Investigator” is the networker for the group. Whatever the team needs, the Resource Investigator is likely to have someone in their address book who can either provide it or know someone else who can provide it. This may be physical, financial or human resources, political support, information or ideas. Being highly driven to make connections with people, the Resource Investigator may appear to be flighty and inconstant, but their ability to call on their connections is highly useful to the team. Explores opportunities, make contacts, shares external information; negotiates with outsiders; responds well to challenges. Based on Belbin’s model of nine team roles, managers or organisations building working teams would be advised to ensure that each of the roles can be performed by a team member. Some roles are compatible and can be more easily fulfilled by the same person; some are less compatible and are likely to be done well by people with different behavioural clusters. This means that a team need not be as many as nine people, but perhaps should be at least three or four. 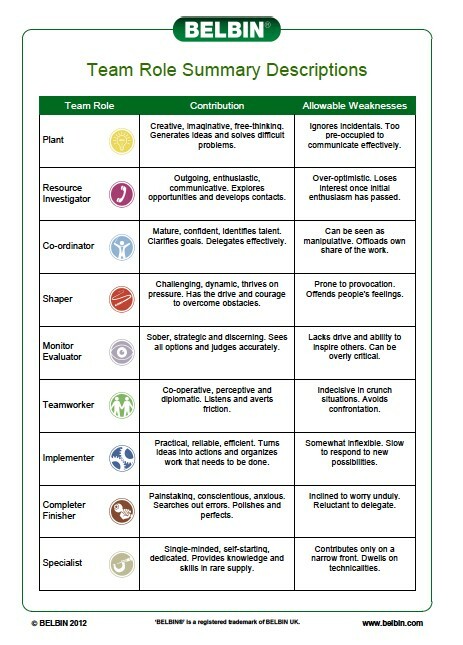 While comparisons can be drawn between Belbin’s behavioural team roles and personality types, the roles represent tasks and functions in the self-management of the team’s activities. Tests exist to identify ideal team roles, but this does not preclude an extravert from being a Completer Finisher, nor an introvert from being a Resource Investigator.